Hotel near North Greenwich Tube Station. Each spacious bedroom is equipped with a desk area, colour tv, satellite news channel, pay movies, direct dial telephone, tea/coffee making facilities, hairdryer and en-suite power shower. The inclusive continental breakfast is served in the hotel's air conditioned lounge. 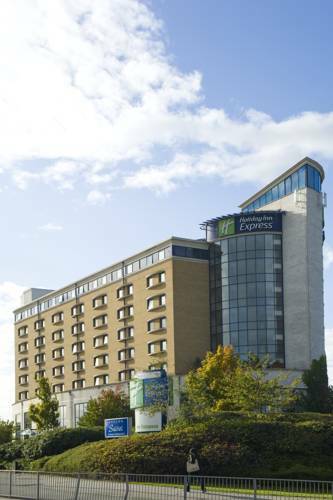 For the leisure traveller, the Holiday Inn Express London Greenwich is just minutes drive from many of the town's famous maritime attractions - the Cutty Sark, the Royal Observatory, the Royal Naval College and the National Maritime Museum. Affordable weekend family packages including free family tickets to the Cutty Sark are available by contacting the hotel. Why not ask a member of our team about our great value Explore London packages, including tickets to top London attractions such as the London Eye, Madame Tussauds and the London Zoo. In addition, for business guests there are 3 meeting rooms with a capacity for up to 100 delegates. Our conference suites are ideally situated on the first floor, with both lift and stair access. All benefit from modern, bright decor, natural daylight and air conditioning, making them ideal for presentations, interviews and training. We include equipment, such as OHP, screen, TV and video and flip charts in our rates, as well as table stationery and refreshments. In your rate we also include unlimited hot beverages which are provided throughout the day and we offer a buffet lunch and snacks at an additional cost. Well appointed double, en-suite room with all modern business facilities. Includes complimentary continental breakfast buffet & 2 adult tickets to BA London Eye. Tickets valid on marked date only. Transfers between hotel and London Eye are not included. Additional tickets are available for purchase at hotel Reception. CANCELLATION POLICY: Reservations must be cancelled 2 days in advance of your arrival date. In the event of a no show or a cancellation in breach of this policy, the cost of the entire reservation will be charged. The cancellation policy may vary per room type; please check the room description as well. COMMENTS: A credit card is required as a guarantee. If the booking is not cancelled outside of the cancellation notice period, your credit card will be charged with the full amount of the booking. The hotel is adjacent to the a102, just 1.2 km from north Greenwich underground station, 0.75 km from the millennium dome & 2.5 km from canary wharf & London city airport. By train: Take under ground to North Greenwich. By car: from the north: leave m25 at junction 27 onto the m11 towards London. Follow m11 towards London and join a406 southbound, then a12 towards blackwall tunnel. Once you have gone through the tunnel, the hotel is on the 2nd left (a2203). From south: follow a2/a102(m) towards blackwall tunnel and take the exit marked Greenwich peninsula (a2203).